This past spring we started making over the exterior of our home. The outside was, as I mentioned many moons back when we bought the house, not the cutest. The house had a serious identity crisis and seemed to be a hodgepodge of the worst architectural ideas from the past 40 years. We finally bit the bullet and found a contractor to make the extreme makeover happen. But this post is not about exteriors! Since we were already going to have a contractor here, I figured we should go ahead and add another small job to his list–the laundry room. Making over a laundry room may fall at the bottom of many people’s reno list. Unless you’re a weirdo–you don’t eat, sleep, relax, or party in your laundry room. You do your dirty work in there, and get in and out as quickly as possible. In our case, the location of our laundry room by the kitchen meant that it was very visible. Because we don’t have a ton of cabinets in the kitchen, it also seemed like a prime spot for more storage. Also, I spend more time in our laundry room than anyone else in the family, so redoing it was a completely selfish undertaking. Laundry room before. Has there ever been a more dejected looking laundry basket? It was an absolutely fine laundry room. It was actually located inside our house which was a HUGE improvement from our last Los Angeles laundry situation. I’m all in favor of open shelving (see kitchen) but it did not work for me in this space. I enjoy trying to give my house the appearance of organization. You can see that it’s all a faćade when you open a drawer, closet, or any other receptacle in which things can be stuffed. The laundry room became a drop-off point for every random thing-a-ma-jig I didn’t know what do with–tools, lightbulbs, batteries, spare change, childhood dreams, etc. I bought baskets for the open shelving, but I’m not a tall woman, and I had to pull them down to figure out what they contained. Usually, when I peaked inside, I was met with all the crap I didn’t want to deal with last week when I was trying to frantically clean up before the guests walked through my front door. Also not working for me was the large, old, whole-house vacuum system in the wall that we did not use (I still don’t understand this concept) and was taking up valuable real estate. I decided to go with the same cabinet set-up as I used in my kitchen–black on bottom and white on top. I wanted the laundry room to coordinate with the kitchen since they were right next to each other, but I also wanted to spice things up. A small space is always a great opportunity to make a bold statement. I’d been eyeing all the gorgeous terrazzo making a comeback as-of-late, and when I came across this tile from Ann Sacks, I fell in love immediately. I was shocked when I called and found out it was IN STOCK and I could get it in a reasonable amount of time. Usually that one tile you love takes somewhere between 8 weeks to 2 decades to come in and you realize you’re just going to have to spend the rest of your life pining away for What Might Have Been, like that Little Texas song (I had a country music phase in college that I do not want to talk about, thank you very much.) Luckily, those tiles wouldn’t have to filed under the-ones-that-got-away. I went with a clean white quartz countertop to match the one in the kitchen. Creating a countertop above the washer and dryer presented a bit of a problem. In order to handle the weight of a quartz countertop above them, I would need a support between the washer and dryer. There just wasn’t the room to take even a few more inches for that. We were moving the small broom closet from the far side of the washer and dryer for easier access, and I wanted that closet to be as big as possible. A wood countertop is a common solution in laundry rooms since it’s lighter than quartz or stone. I went with walnut. I loved what CB2 had going on in their handle department. I ordered multiple ones to test out. I considered not going with brass, but when I put these shiny suckers up, I couldn’t say no. When I was homeschooling my kids, we read a book named Rascal about a pet raccoon who always collected shiny things, because apparently Raccoons like shiny things. So I guess I have that AND dark circles around my eyes in common with them. And then I painted it PINK (apologies to all my English teachers ever for starting a paragraph that way.) The actual color is Sherwin Williams Comical Coral. The room needed a pop, and pink just makes people happy. I’m like 7 years late to the millennial pink trend, but it’s practically a classic now, so stop trying to shame me, okay?! Every time I go into this room now, it makes me smile! If anything with laundry in its name can make a human smile, I consider that a success. The living room was one of the things that sold me on our house. Since our house was built in the 70’s when sunken living rooms were the thang, you actually step down into the room, because apparently, relaxing is grooviest at lower altitudes. With a vaulted ceiling, the room is open to the upstairs. This is a great set-up from which 7- year-old boys can throw parachute men, paper airplanes, and stuffed animals, and it gives the space some visual drama. It is not, however, great for watching the Walking Dead while your kids are trying to sleep. The previous owners did a lovely job decorating, but the style was not mine. However, I absolutely agreed with the 2 of their choices. They chose a sectional couch, which made tons of sense for the best tv viewing and number of seats in the long, narrow room. Also, they nestled the tv in the middle of large bookshelves on the wall. I loved both of these ideas, but knew I wanted to go less subdued and little more funky – okay, a lot more funky. One of the reasons I had trouble warming up to the house was that it felt as though it didn’t have any identity. It wasn’t firmly anything, and the exterior was especially confused. I was looking for ways to inject identity into the space starting from the inside, and that ceiling felt like it held a few clues. The ceiling was begging for something. It was a huge expanse of whiteness, with recessed lighting. It was really high and there was absolutely nothing wrong with it, which is precisely what you do not want someone to say after a first date. I knew I wanted to push this confused house in a Spanish direction, and wood beams seemed like just the trick. If we’re talking wood beams, can we just flashback to this Jessica Helgerson kitchen with which I will forever be in love? The long, narrowness of the room held some keys. While unusual spaces can be frustrating, they also present unique opportunities to do things you wouldn’t have imagined if you weren’t constrained by the space. Sure, who doesn’t love big square rooms with windows, doors, a fireplace, and electrical outlets in the perfect spots? Yawn. I want to see a room with a window on the ceiling and a spiral staircase smack dab in the middle. Now we’re talking . . . about a submarine . . . which is not exactly what I meant. What I’m trying to say is that weird rooms have personality. That whole “necessity is the mother of invention” thing applies beautifully, especially when it comes to creatively decorating and designing our spaces. I went to Pinterest and began dreaming. I could expand on the original owners’ idea for this long wall with some built-ins. They would give me the chance to fulfill a life-long design dream of having a library ladder, which might be a little ridic (isn’t that what the kids are saying these days?) but no more ridic than having high shelves that you can’t reach. These built-ins by Tristan and Juliana are in a room with a vaulted ceiling (like mine) and beams too! Sarah Sherman Samuel knocking it out of the park per usual in her vaulted ceiling living room. Okay. It’s not a living room, but there is a library ladder. Actually, it’s just an excuse to put another space in here designed by Jessica Helgerson. Pretty soon this whole blog is just going to be a link to her website. If you need built-ins, you’re going to have to use math. MATH. I do math, but I don’t like it. My husband was an engineer many moons ago before he did entertain-y stuff, so he and math got along just fine. When I told him about my plan we decided, “We should do this together!! Won’t that be fun and won’t we not want to kill each other?! Of course we won’t that sounds perfectly reasonable!! !” We said that in unison just like it sounds. We are that in sync with each other. He got excited and got graph paper, and I just kept looking at Pinterest. I was hoping to find a way to completely cover up the tv with books so it would be purtier (that’s what we say in the south) but he kept making the space for the tv larger, which is not how that whole being in sync with each other thing is supposed to work. This living room by Australian clothes designer, Lee Matthews, is breathtaking. And where does that little door go? If there was going to be a big tv, maybe I could balance it out with a book nook. A book nook might say, “Look! People who live here like to sit quietly and read. Pay no attention to that idiot box that’s in the very center!” (Didn’t your grandma call the tv an idiot box too?) Also, there’s something a little magical about really small nooks that can only fit one person. Give me 24 inches, a pillow, and a blanket and I’m going to make a nook out of it. There would be no window in our built-ins, but this little girl just convinced me that my inner child really likes nooks. I was beginning to realize that I had a 70’s, Spanish, book-filled living room that was begging to break out. So I decided to let it. When I last left y’all, I was still in search of the perfect piece of art for my kitchen nook, but hadn’t found the one that made me feel all the feelings. I didn’t want to finish off the space that I had worked so hard on by just throwing something up on the wall that did not speak life into the depths of my being -IS THAT TOO MUCH TO ASK? I wasn’t sure if I wanted a modern black and white abstract piece or something that felt like it had more history. When the upholsterer came over to measure for the kitchen nook, he told me my style was transitional. I thought about telling him his voice was annoying and his breath smelled like the backside of a hyena, but I refrained. I’ve always hated the term “transitional.” It feels like it’s the embodiment of someone who’s afraid of commitment, someone who’s neither here nor there, someone who listens to muzak on purpose. I think what he meant to say (or what I meant for him to say) was “eclectic”… a mix of styles. My friend Rebecca described my space as “elevated 70’s” which made me want to tell her that her voice sounded like baby angels singing and her breath smelled like chocolate cake (that’s pretty much the highest compliment I can give a person). I have a lot of nods to the grooviest era happening in here, with Boho/Moroccan influences, especially in my soon-to-be-revealed living room. I also have a large dose of Hollywood Regency style with a black, white, and brass theme running throughout the house. All that to say, I could have gone a lot of directions with the art for this space. Just as an aside, if you’re thinking that your personal style is “whatever piece of furniture my parents were getting rid of with an influence of whatever was hanging out on the side of the road with a ‘Free’ sign” I feel you, and I think some of the most creative spaces can result from using things that have some history, some soul, and don’t cost a lot. I had seen one piece of art that kept tugging at my heart. I decided to call one of my people. One of my favorite things about dipping my toe into interior design are the beautiful, creative, talented artists I’ve gotten to meet along the way. In fact, one of my hopes for this blog is to be able to introduce you to some of these people and their work. LA is a big, overwhelming town, so there’s something so satisfying about knowing the people all over this city to call when you’re looking for something specific. They will either have it, create it, or point you in the right direction. There are plant people, furniture people, art people, hardware people and people all in between. I met Corban a few years back when we worked on a short film together. Since then, she started an awesome business called The Here Company in which she does some jaw-dropping house staging around LA. She is dripping with creative talent herself, and also knows tons of artists and designers around our fair city. I had seen my painting (okay-it wasn’t mine yet) in one of her friend and fellow stager/designer’s instagram pics, so naturally I called her to see if she could work some magic for me. “Do you think he’d sell it to me?” I ventured. Lucky for me, Corban’s friend had just stepped away from his 9-5 gig to start buying and selling his stellar finds full time. Corban told me she’d take care of it…like some sort of Godfather of design. Not really, but it seems more dramatic that way. When I arrived at Jason’s house to pick up the art, I freaked out a little. Corban had sent me a picture from there before of a beautiful burl table he had that I might be interested in, and I knew he had some gooooood goods. She warned me that every corner of his place was like a designofile’s dream. That night, he was in the process of cleaning out and photographing all of the insanely cool stuff that he had collected throughout the years and had been sitting in storage. There were funky sculptures, old rugs, vintage paintings and strange artifacts…and I considered stealing them all, but some stuff was heavy and I would need his help to get it in my get-away car, which might have made things awkward. I did find out that Jason came by his love of design honestly, like me, from his mom. Among her creative endeavors was a jewelry business named Just Bead It, which sounded a lot like my mom’s hair bow business Bow-dacious. This gave me hope that he might give me the “Child-of-a-mom-with-a-punny-business-name” deal. My beautiful painting was sitting among the other treasures. It was a landscape with rich, dark colors, frayed edges, and no frame. It tells a story, of those 3 tiny figures in the canoe on an adventure beneath that goliath of a mountain, but also of the mantels it must have graced and people who must have loved it throughout the years. It’s the perfect juxtaposition to my clean, brass light and is large enough to fill the space. So I took it home…along with another abstract painting to try, a Xoacan bell, and a… whale vertebrae. You heard me. Whale. Vertebrae. When I hung the art up, it felt like the piece that was always supposed to be there. I’m glad I waited. If you want to see and buy some of Jason’s stuff, you can find him on Instagram @americangarage. You can check out my friend Corban’s beautiful work here or on Instagram @theherecompany. Tell them I sent you. I promised a reveal, and a reveal I have…finally! I dug up some previously unseen before photos that will give you a much better perspective on the changes we made. Where to begin? The first day we moved in, even though the kitchen was still very much in process, I was in disbelief and overwhelmed with gratefulness. It was hard to wrap my head around the fact that I would get to wake up to this kitchen. Though the floor tiles I landed on were more understated than my original inspiration, I think they work, and also compliment the mix of cabinets without overpowering them. I loved the continuity from the den to the kitchen of the white brick backsplash , and I felt like it gave the kitchen a sense of history. I think two of the decisions that were the easiest to make, also had the biggest impact. Removing the tray ceiling to give the room a little more height and knocking out the small, awkward wall between the kitchen and eat-in area opened up the space in a big way. Deciding how to orient the rest of the kitchen was not so cut and dried. I envisioned a few different stations in the kitchen. I was hoping for a bar-height counter where the kids could sit and talk to me as I baked my grandmother’s from scratch 6 layer carrot cake umm…heated up Trader Joe’s chicken nuggets. I thought a breakfast nook would be the most efficient use of the eating space, since it wasn’t large and a sliding glass door took up most of the back wall. I also wanted a place for our computer. We didn’t have plans for an office anywhere else in the house, and I knew, especially with homeschooling, we would be spending most of our time in the kitchen. My long-suffering husband and I spent an…ahem…”spirited” night working on the kitchen plan. There were a few points where I thought I might have to send my dreams of a bar off to Never-Never Land. But we kept playing with the plan, measuring, and walking the space, and we finally landed on this configuration. It was a beautiful moment. My bar would be small, but it would be mighty, and would also be the perfect place to set a golden loaf of prop bread. I really love our little breakfast nook. It’s just the right size for the four of us to have intimate family dinners over dinner-y type food. Everyone has perfect manners while peaceful classical music drifts through the background. The kids use their utensils and always gobble up all the green things I put on their plates, then beg me for seconds followed by, “as long as you don’t make me partake in dessert, Mother Dearest!” There is no gagging, crying and negotiating, and everyone cleans up after themselves when dinner is over. Apparently, these are the kinds of things that happen when you just get a breakfast nook. If only I had known all along. I’m a big fan of this light fixture from West Elm. I wanted a fun, modern pop of light over the table. I’m still a little disappointed with the black electrical cord that hangs down from the top and am concocting a way to remedy it. This little bell holds a special place in my heart. It was my companion for many hours of imaginary play as a child at my grandma’s house. It seemed grown up and magical all at once. A few years ago when we were home visiting, my “Gaga” nonchalantly bequeathed it to my youngest child. After almost hyperventilating, I promptly told him I would “keep it safe” for him. He didn’t love the idea, but I’m bigger than he is, so obviously, I won. The copper cup was a birthday gift from a dear friend. The big blank space above the breakfast nook created some serious internal conflict in me. I have been looking for that perfect piece of art that will tie the room together. I assumed it would appear to me right before I had the kitchen photographed. Last year, when I was down to the wire finishing up my husband’s office, I found 3 or 4 pieces of art at vintage/second hand stores in one day. Apparently, those stores never recovered from my haul. I went back and they had nothing. I searched Craigslist. I looked at all my favorite sources online. But I had waited too late. And now whatever I ordered wouldn’t get here in time. I contacted super-talented artist friends to see if they had anything that would work for the space. I went on an “art walk” and showed official seeming people pictures of my blank wall. I begged artsy strangers for help. I made a lot of friends but came home art-less. I found pieces I loved for other spots in the house, and did land on a few pieces that could work for the nook. I came very close to buying something to keep from having a space with nothing. But then I realized that that was dumb. Was I really going to spend money on art that wasn’t the one, just so it could be photographed for my own blog? That would be like marrying a guy who was nice enough, just so you could have someone to take to your high school reunion. (I realize that’s a little hyperbolic, but you get the point.) When I finally decided that I would wait, I felt so relieved. So here is my blank wall, that will stay blank until I find the one. And then, I’ll take another picture of it, and it might be with my iPhone, and that will be okay too. I chose white quartz counters. I wasn’t sure if I’d miss the Carrera marble that we put in a previous fixer-upper, but I wanted to try something new. I kept the counter at the desk area high, so that I could sit or stand at the computer. We also installed a wine fridge, because, well, wine. I spend an inordinate amount of time sitting on that stool and staring at that computer, which is actually the computer I’m staring at right now, which means I might be caught in some kind of time vortex. I chose 10 1/2 inch brass pulls for the larger drawers, and 5 inch pulls for the smaller ones. Whenever it was possible, I picked drawers over cabinets, since they give you a much better view of all the things you’ve stuffed inside of them. This fruit bowl was a souvenir from a family trip a few years ago to Costa Rica, but let’s be real, I don’t buy whole artichokes on the regular. Thanks so much for letting me share my kitchen rehab with y’all! I’m sure it will continue to evolve, and hopefully, that piece of art will make itself known sooner rather than later. I’m looking forward to posting more of the projects I’ve got going on around here, and anyone else’s projects I can get my hands on, too! Also, I’d love to introduce you to some of the beautiful shop owners and artists of all kinds I’ve met on my design adventures around LA. Many thanks to the ridiculously talented Bethany Mollenkof for photographing my kitchen…and puppy, too! I’ve heard it said that cabinet pulls are like jewelry for your kitchen. And I like jewelry. When I started looking at kitchen jewelry, I kept running into gold and brass beauties as I browsed Pinterest. Many people can’t get past their negative associations with the brass and gold of the past to even consider thinking about putting the cuties in their current space. But the new gold or brass feels much more modern (and much less Donald Trump) than what we found in the kitchens and baths of yesteryear. Think 1989, the T-Swift album, not 1989, your middle school picture. There are matte and brushed options, and the lines are considerably cleaner. But if after considering your options, the gilded hardware still gives you the heebie jeebies, you should absolutely not use it. The Universal First rule of Design is to only use what you love. And I was head over heals for those gold/brass tones. Thankfully, gold handles don’t necessitate gold everything else. Just because you choose gold or brass handles doesn’t mean you have to choose a gold faucet or a gold microwave (do those even exist? If they don’t, they should.) I decided on 2 different lengths of gold square t-bar pulls for my lowers, and tiny cone knobs for my uppers. I love mixes, and a mix of handles not only keeps things interesting, but can help you to save a little money too. If you’ve fallen in love with handles that are a little more than you wanted to pay, you can use them strategically and fill in the rest with a coordinating but less expensive option. Usually, there is some sort of natural delineation in your cabinet configuration that can help you make the decision. Divide by uppers and lowers or drawers and cabinets. Go Wild. I ordered my handles, and apparently, a lot of other people did too. It would be a long while before I could get my hands on those handles. If you need to order hardware, do so as soon as you know you need it. For some reason, hardware manufacturers like to create demand for their handles by only crafting enough for the people who have fake Pinterest kitchens. The rest of us normal people have to wait forever, and by the time we get them, the Pinterest people have moved on to handle-less cabinets. I spent the first month in our new kitchen with classic, yet modern blue painter’s tape for handles. This makeshift hardware works by attaching the tape to the inside of the drawer so a little folded tail hangs out over the top and acts as a handle. Half of the time, that tail gets stuck inside, and there is no handle. When that happens, you start by grabbing the lip on the bottom of the bottom drawer and pull each drawer out, all the way up until you get to the drawer you want to open. By then, you’ve forgotten what you needed in the first place, and you don’t care if you have handles or not. Stick around! I’m hoping to be able to reveal my kitchen sometime in the next 2 weeks…unless, of course, I chicken out. While I decided against using the black and white floor tiles (for now) I knew for sure that I still wanted a very black and white kitchen. Black cabinets on the bottom and light on top are often referred to as a tuxedo kitchen. This color scheme is ideal if you want the drama of dark cabinets, without the heaviness. The black bottoms keep the space grounded, while the light uppers keep it open and airy. I also decided I wanted to mix cabinet styles. That may elicit a cringe from my friendly readers (the three who aren’t blood related). I’m not sure exactly what drove me to that decision besides Pinterest and a fear of commitment. I do think it’s a kind of amazing illustration of my personality. As I’ve firmly established, choosing is not a thing that comes easy for me. I’m naturally an optimist, and I often believe that there will always be something better. It’s a good thing my husband wasn’t lacking in the self-confidence department when he wooed me. At some point early on in our engagement, I was very honest about how scared I was to be making such a big decision (we were babies, by the way). He remained completely unshaken and responded with, “If you don’t marry me, who the hell are you gonna marry?” Clearly, he was the one for me. Unfortunately, cabinets don’t speak quite as clearly as young, overly confidant fiancés. I vacillated between having the cabinets custom made and going the Ikea route. Ikea cabinets are basically magic. All it takes to be under their spell is to walk into an Ikea. Granted, it might take you 3 years to find the kitchen department, but once you do, you’re toast (that was a kitchen joke.) Ikea kitchens are Nordic fairy lands where spices stay organized, cabinets flaunt their spacious quarters, and trash doesn’t stink. You really do believe that you will instantaneously become a hip, yet organized Swedish model/chef if you simply get your hands on one of those Fyorjofferståtinkis. (Did I make that up? Maybe you should learn Swedish and find out.) Since Ikea cabinets are affordable, easily acquired, and get rave reviews from users, I decided to put my money on them. In the end, I chose black shaker cabinets for the bottom and modern, high-gloss, white uppers. I also added some custom open shelving in walnut, and a custom walnut island. A few years ago, if you would have told me I’d be putting shiny, modern, white cabinets in my kitchen I probably would have told you to stop cussing. Before moving to the West Coast, I was not a fan of modern anything (except medical practices). But the more I saw those clean, unfussy lines, the more they grew on me. I took a chance on not choosing just one style of cabinet and prayed that all these disparate choices would play nicely together. Backsplashes probably didn’t even exist until people had time to stop worrying about their crops freezing or their family members catching the plague from the fleas who lived on their house rats. Before there were backsplashes people just had…walls. Then a sneaky tile maker named Howard realized he could make a mint if he convinced people that they shouldn’t just tile their floors; they should keep going ALL THE WAY UP THE WALL. We should actually be grateful to Howard for beating the rug guy, Harry, to it, because cleaning bacon grease off of a Persian rug or (worse!) shag carpet on the wall behind the stove would be super gross. Thankfully, choosing my backsplash did not create the level of internal conflict in me that choosing my floor did. In fact, I felt as though my backsplash decision was clear, and for this, I rejoiced. The white brick in the den and master bedroom was one of the characteristics of the house that made me fall in love with it. In a house that seemed very confused about who it was, the painted brick gave it a sense of history. It felt old, yet clean and fresh. The kitchen shared the white brick wall with the den, but the kitchen side was tile. Knowing that I wanted to incorporate a few modern design elements in my kitchen, I felt like using the brick as a backsplash would keep the space grounded. Although a painted brick backsplash isn’t quite as easy to clean as tile, it sure beats cleaning a shag rug. Actually, this IS my (mid-renovation) kitchen. Stick with me on this photo thing. I know these pics are depressing, but I included the other pictures of beautiful kitchens so that your eyes would have something pretty, well-photographed, and finished to enjoy. Also, because it’s the best, you should read this post from Victoria Elizabeth Barnes about kitchen madness. It’s an oldie, but a goodie. Demo on my kitchen had begun, and the clock was ticking. I had to make a decision about these darn tiles, and it it had to be the right one, because everybody knows that interior design is a TEST. There are right and wrong answers. If you make the wrong decision, people will secretly take pictures of your house and pin them on their Pinterest board entitled “Design Fails” and you will get famous for failing so hard. I did not want that to happen. So I did a lot of research, which is obviously the best way to do interior design. I’m only joking…ish. I think one of the reasons redesigning a kitchen is rough for those who are decision averse is that the decisions being made are not small, inexpensive decisions. This is not like buying that pillow on the clearance aisle at Target that you may not like a year from now (or when you get home from the store). And it’s definitely not like picking a nail color at the salon (which, as my friends can attest, takes me an embarrassingly long time). I’m talking about choosing floors that I actually have to pay people to INSTALL in my house, with like, tools and grout and stuff. I spent a lot of time looking at tiles here , here, and here. And occasionally, I had the fortune of stumbling upon one of these gems in person. I had to choose from the in-stock tiles on these websites, and while I really did love so many of them, I had little nagging doubts about every design. One felt too trendy. Another felt too ornate. The scale on another just didn’t seem right. If time is not a factor in your kitchen reno, you can actually custom design your tiles. This was not the case for me, though. I couldn’t allow my procrastination about this decision to hold up the whole renovation. I was starting to have flashbacks from my high school junior year Research Biology science project…and we all know how that turned out. At one point, I thought I was nearing a decision, but when I put the tiles in the price estimator, I got a sinking feeling. Was the price doable? Yes. But did I have that “know that you know” for the price? I couldn’t say that I did. After many hours spent with the black and white encaustic beauties, I bailed. I decided to go with good old white porcelain hexagon tiles. While part of me felt as though I was missing an opportunity for something funky and fresh, another part of me felt relieved. While decisions can be challenging for me, I’m a huge fan of taking risks in design, as is evidenced by my very orange, very large, velvet living room sectional. But sometimes a particular risk just doesn’t sit right, and you don’t really know why. Maybe it wasn’t the tile that I was so drawn to in Jessica Helgerson’s kitchen, maybe it was that high contrast black and white overall color scheme, the open shelving, and the swaths of wood to warm it up. But I know what you’re thinking, “Can she get the same dramatic feel without that gorgeous statement tile?” These are the kinds of deep, soul-searching questions we will fearlessly face here together my friends. Be brave. Also, I still have some bathrooms to renovate, so you know, those tiles and I just might have a future together. When we moved into our house one of the first things I noticed was the hardwoods. Like any person with eyes, I love hardwoods. They are so versatile. They are at home in lofts and farmhouses, massive villas and tiny apartments. Though many will disagree, I love hardwoods in a kitchen (water damage, I scoff at you! ) If we were going to rip out the floor in our kitchen, hardwoods would be the obvious choice for a replacement, right?! But to employ my 7-year-old’s current favorite phrase, here’s the thing: I didn’t like these hardwoods. This is clearly on the list of first-world problems, maybe even akin to that time Kanye said, “Fur pillows are actually hard to sleep on.” Now that I’ve acknowledged that, I’ll move on. 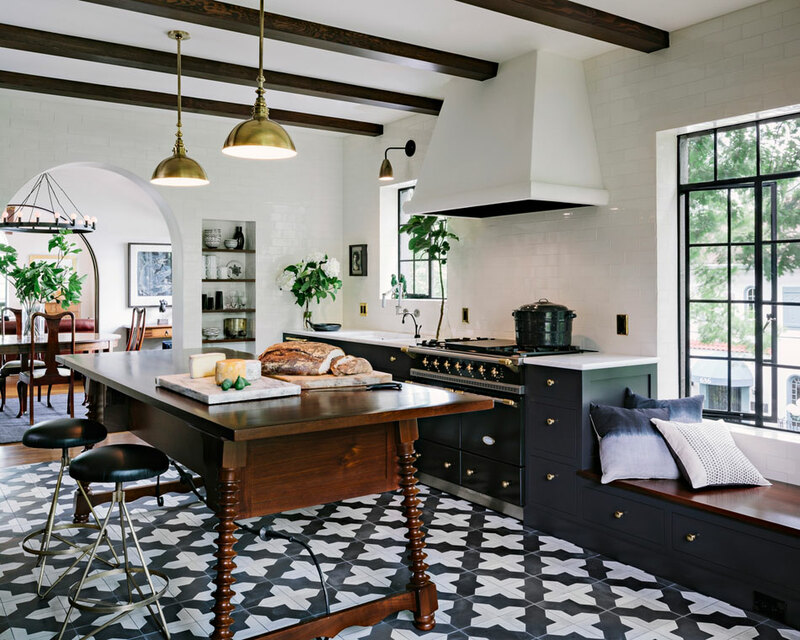 One of my favorite things about Jessica Helgerson’s kitchen design was those beautiful black and white encaustic tiles she used. I decided that for my kitchen, the floor would be black and white. Funky black and white tiles were popping up everywhere, so I figured finding the ones I loved wouldn’t be too daunting. Here are just a few of the photos that guided my search… Which is your favorite? After sealing the deal on our new digs, we had about 6 weeks to our move-in date, which is plenty of time to completely renovate a kitchen…if you want to develop an eye tick, sink into a depression, and allow small animals to nest in your hair. Okay, the animals didn’t actually nest in my hair. It was more like a sleepover. I was incredibly fortunate to have an amazing contractor that I was introduced to by a designer I worked with on another project. Pablo was certain that he could get the kitchen to a livable point by our move-in day. That meant that all I had to do was to come up with a reasonable plan for the new kitchen. Easy! I could just go to Pinterest, find a kitchen I liked, and say to him “Can you please make it look like this? And can you please put that wall thingy beside the cabinet doohickie?” The end. In all seriousness, Pinterest is an amazing resource. Yes, it can give us incredibly unrealistic standards for just about anything, but when you feel overwhelmed with all of the possible options, it’s a great place to begin to figure out the identity and feel you want your space to have. I find that when I know the general direction I’m heading, it makes the decision making process much easier. A few pictures of rooms you love give you an anchor point when you feel like you’ve lost your way in a sea of possibilities. Your room is not going to be a carbon copy of that pin from your favorite blogger or pinner…and that’s a good thing. Your space, budget, and personality are not their’s, and that’s what makes the design process so much fun. Pick a few things that made you fall in love with that room, and incorporate those elements. I decided I would let my Spanish roof lead the way. Although my house would never be a true Spanish villa, I knew I could incorporate nods to la casa buried somewhere under that vertical siding. This kitchen by Jessica Helgerson inspired and yes, haunted me throughout the design process. It had a Spanish feel without the overly ornate elements that can keep a Spanish space from feeling young and fresh. The black, white, and brass color scheme with the splashes of wood for warmth made my heart skip a beat. While I knew I wanted to go in a more modern direction, there were so many things about this kitchen that kept drawing me back in (maybe it’s that incredible loaf of carbohydrates sitting on that gorgeous table, turned island.) I had my jumping off point. Now there were only 563,721 more decisions to go.